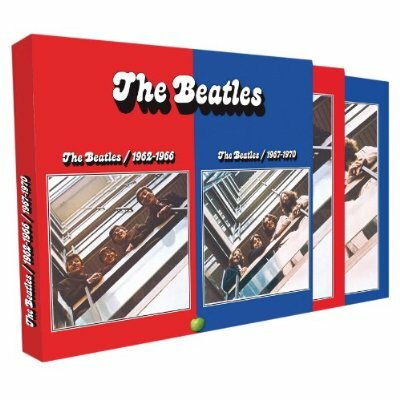 I’m really surprised to read on Amazon (US) that the Beatles “1962-1966 (Red)” and “1967-1970 (Blue)” combination box set is still not due for release in America until December 7th, and on Amazon (UK) that it won’t be available there until November 29th. The individual discs have been available separately in both places since October 19th and October 18th respectively. This is really odd because here in Australia the separate discs and the box set have been available from day one of the worldwide release of the individual discs on October 18th. It’s much more usual for Australia to be well behind US and UK releases, but this time EMI Australia has clearly got its act together and is ahead of the pack for once. Add to that the fact that I ordered on Ebay – and today have received in the post – my copy of the European (EU) version of the box set which holds both the “Red” and the “Blue” double discs in the one box. Go figure….. 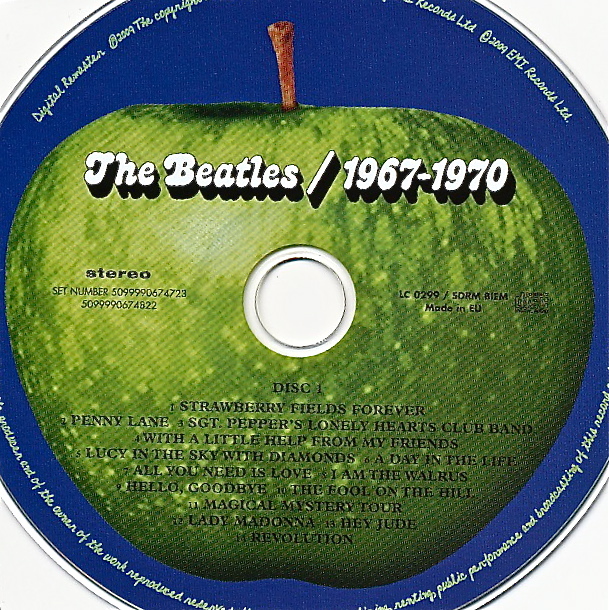 This entry was posted in Apple Records, Beatles, Beatles Collecting, Beatles Music, Stereo Remasters and tagged Apple Records, Apple Reissues, Beatles, Beatles 1962-1966, Beatles 1967-1970, Beatles Collecting, Beatles Red and Blue, Beatles Remastered by beatlesblogger. Bookmark the permalink. Having collected pretty much all the Beatles’ CD releases since 1987, I would like to present my considered (but by no means definitive) views on the re-release of the ‘Red’ Album Compilation (1962 -1966) which has been newly minted in remastered form by Apple Records. For all fellow Beatles fans considering whether to invest (again!) in this title – I have played and compared it, track by track, against the original 1993 CD and also against previous digital releases that hold some of the same tracks, namely The Yellow Submarine ‘Songtrack’ CD Album (from 1999) and The Beatles ‘1’ CD Album (from 2000). My aim is to provide a useful, constructively-critical guide to anyone unsure about committing themselves to this purchase. I found the version on the ‘1’ Album to have better focus to the vocals and more clarity to the tambourine than both the 1993 & 2010 Red versions. I think The 2010 ‘Red’ version has better bass definition than the 1993 ‘Red’ version and the electric guitars sound crisper, Ringo’s background drum fills are also cleaner. It seems to me that the ‘1’ Album’s version sounds less bright overall than the 1993 & 2010 ‘Red’ versions, with John & Paul’s vocals being noticeably clearer with less (distracting) delay to the studio echo which George Martin applied to them. In my view the ‘1’ Album has the better version of this track than both the 1993 & 2010 ‘Red’ versions as the mix is less muddy and the symbols don’t tend to wander in and out of focus, Paul’s bass and Ringo’s drums are also better defined. Although I think that the new 2010 ‘Red’ Album version is an upgrade of the 1993 release, it’s only slightly better than the version on the ‘1’ Album, with the stereo image being slightly wider and the hand-claps that punctuate the track (which are provided by all four Beatles)sounding more lifelike. I actually prefer the 1993 ‘Red’ Album version of this track to the 2010 ‘Red’ Album version, as the vocals and guitars appear clear and crisp in the centre of the stereo image – the newer release has them driven (annoyingly) hard right with the remaining instrumentation placed more distantly left of centre. In my view the version found on the ‘1’ Album contains a better rendition than either the 1993 or 2010 ‘Red’ Albums – having a bolder presentation of Paul’s vocals, cleaner lead and rhythm guitars and added depth to the bass; there’s also a satisfying punch to Ringo’s kick-drum. The 2010 ‘Red’ Album gives a slightly wider and taller stereo image than it’s 1993 counterpart, it also presents far more detailed and realistic bongos and better focused vocals, bass and electric guitars. The 2010 ‘Red’ Album again beats the old 1993 CD release with a rendition that adds just the right amount of gain to bring out the full emotion of Paul’s lead vocal, perhaps at the expense of just a touch more audible tape hiss, the trademark blocks used as percussion throughout the song also have a more realistic ‘clack’ which is all conveyed with better reverb & studio depth. The smoother intro to The 2010 ‘Red’ Album version and its more accurate portrayal of Ringo’s drums and symbols steadily builds to create an image that beats the ‘splashy’ mix on the previous 1993 release. The new 2010 ‘Red’ Album’s rendition is now far less ‘brittle’ as the opening guitar feedback is generated and the lead guitars kick in, John’s double-tracked vocal is also now clearly portrayed in the centre of the stereo image. I actually prefer the Beatles ‘1’ Album version of this track, the stereo is ever so slightly wider with larger sound to the vocals, guitars and drums. Again I feel that The Beatles ‘1’ Album has the better sounding version of Paul’s classic song, his acoustic guitar sounds a little more ‘real’ with a more audible ring after the strings have been gently strummed; the chamber Orchestra sounds fuller and cellos especially can be heard to better effect than the 2010 release. In my opinion the 2010 ‘Red’ Album version relays the best version of this superb song, the added clarity now means there is now no doubt that both 6 string and 12 string guitars exist in the rhythm track and John’s pleading vocals are placed fully forward in the mix. In my opinion The 2010 ‘Red’ Album version has the best portrayal of the tambourine, maracas and 12 string guitar used on the backing track, John’s vocals are superior to the 1993 release. It’s my belief that The Beatles ‘1’ Album has the best sounding version of this joint collaboration between John and Paul, as Ringo’s drums sound more realistic and the picture painted by backing track comprising the accordion, tambourine and symbols is more solid and crisp than the 2010 ‘Red’ version. I think the best lead and harmony vocals of this track can be found on the Beatles ‘1’ Album version , they also don’t suffer from audio drop-out and the lead and bass guitars sound far better than the 2010 remaster. The 2010 ‘Red’ Album now gives a clean and accurate representation of this bouncy song that beats the old 1993 ‘Red’ album version with ease the vocal echo now gives studio depth to the lead vocal provided by Paul. I believe The 2010 ‘Red’ Album has the best sounding version of this song from John, the remastering now brings clarity to George’s Sitar and makes is clear that there were timpani bells as well as tambourine used in the percussion. I believe the version on The Yellow Submarine ‘Songtrack’ CD sits head and shoulders above those created for the 1993 or 2010 ‘Red’ Album releases in fact the stereo image is so broad, defined and detailed it makes the other albums’ versions sound almost mono in comparison. Starting a run of three tracks that sees the 2010 ‘Red’ Album as the place to find the most satisfying versions, this pseudo-French song from Paul is now a step-up from the 1993 release in most departments, most obviously with the fuller bass and cleaner vocal. The 2010 ‘Red’ Album continues its run with John’s moving retrospective song, the new remastering bringing Ringo’s drums and symbols into a fuller stereo image packed with information. The final track in this fine run for the 2010 ‘Red’ Album has the sultry brushwork by Ringo on his snare drum clearly sweeping around the mix with ultimate realism, the strong intake of ‘breaths’ from John are also now far more detailed. I think the Beatles ‘1’ Album gives a better view of this song than either of the 1993 or 2010 ‘Red’ Album releases, the lead vocal stands further forward of the harmonies and the bass really drives hard. It’s abundantly clear to me that the version contained on the Yellow Submarine ‘Songtrack’ CD is the one that leaves the listener most satisfied; it has been created without the clumsy panning to the right when Paul first delivers the vocal of ‘Eleanor…Rigby’ and it also includes superior depth and detail to the cellos as well as conveying all the drama of the score George Martin created for the Chamber Orchestra. Without a shadow of a doubt the best version of this track still remains the title track from the Yellow Submarine ‘Songtrack’ CD, it surpasses the version on the 2010 ‘Red’ album in every respect. 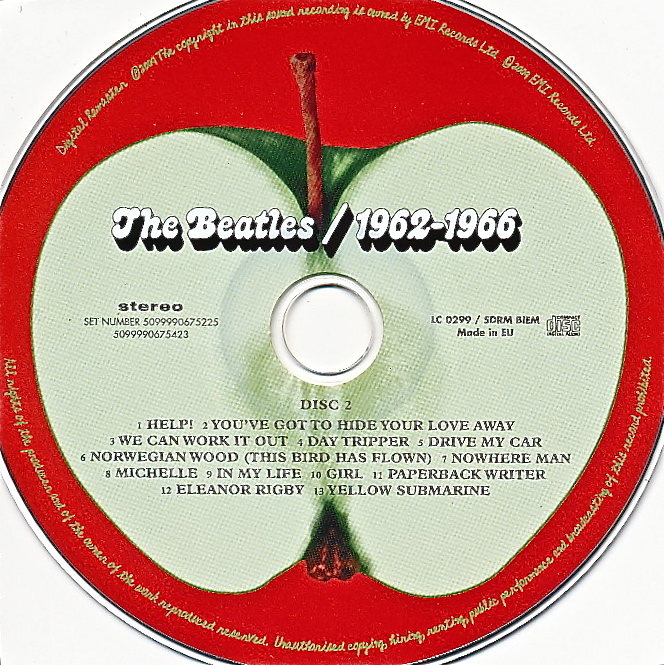 So in closing, I recommend this new 2010 release to all those new to the Beatles musical catalogue as it’s the best place to start your journey of discovery – for all those others who are already ‘hooked’, you can buy this CD knowing most of the tracks will give an upgrade in sound quality to the 1993 release…. However, if you don’t have them already, I also recommend that you buy The Yellow Submarine ‘Songtrack’ & ‘1’ CD albums to fully realise the best sounding versions of these 26 tracks. Wow. What can I say? I have to hand it to you for research and thoroughness in comparing the different versions available. Thanks for posting this and I’d be interested in further impressions of the the Red and the Blue newly remastered versions now available. One question for you piotrkzrzyzek2. What hi fi equipment were you making the comparison on?